Persistence Market Research has provided an in-depth analysis on the global smart ticketing market in its recently published report titled “Smart Ticketing: Global Industry Analysis (2012-2016) and Forecast (2017-2022)”. This report will allow stakeholders to better chalk market strategies. Further, the report objectifies the market on various parameters at a global level to identify the vital elements that are likely to influence its dynamics over the next couple of years. This report evaluates the current scenario and future prospects of the market. The forecast presented in the report is based on a comprehensive assessment of the overall market performance between 2012 and 2016. The forecast has been offered in terms compound annual growth rate as well as by evaluating the year-on-year (Y-o-Y) growth to understand the changing characteristics of the market. PMR’s report has covered various elements including market drivers, trends, developments, restraints and opportunities that influence the future prospects. These market elements are analyzed across key regions thereby interpreting a global overview of the smart ticketing market. The report offers a comprehensive analysis of the key market dynamics in order to assist readers in planning the next step from a business point of view. In addition, the reader will gain access to information regarding regional markets that present attractive growth opportunities. The report offers an unbiased and pragmatic market scenario. PMR has utilized an innovative and highly credible research methodology for gathering market data and stats. A comprehensive assessment of the global market for smart ticketing has been made by utilizing a thorough research methodology that includes both primary and secondary resource input. The information gathered is then validated and re-examined at each point during the course of research, which ensures high data accuracy with value and zero chances of discrepancy. While compiling the report, inputs from industry experts, company executives and market observers has been extrapolated, enabling analysts to arrive at certain conclusions regarding market statistics. 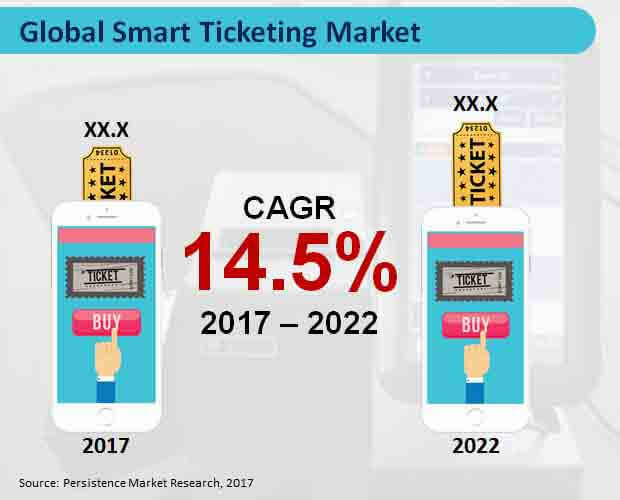 A section of the report discusses the competitive landscape of the global smart ticketing market, which will allow the reader to understand the competitive scenario and gain information about market share of leading players. In this section of the report, the reader will also come across market strategies of leading players, key developments, regional presence, product portfolio, mergers & acquisitions, financials and revenues. The reader will comes across an all-inclusive analysis of important aspects of the market’s competitive landscape. The assessment of the competition in the market is conducted in a systematic manner to obtain highly accurate information. The exhaustive research report on global smart ticketing market offers key insights with descriptive analysis. A group of analysts at PMR with extensive knowledge of the domain strived rigorously to gather market information. Persistence Market Research is committed to take the extra mile for providing unbiased market data which can be actioned by analysts thereby enabling them to achieve their research objectives. The report is uniformly structured to deliver convenience along with a complete package of market intelligence. Growing need to access the smart transit system has led to an upsurge in demand for smart ticketing. Replacing the paper tickets, the smart ticketing system has also made inroads to tourism and transportation industry. Increasing demand for quick access to the movies, parks and theatre is expected to impact growth of the global smart ticketing market. Persistence Market Research states that the global smart ticketing market is expected to represent a value of over US$ 5,000 Mn by 2022-end. Incidences of revenue loss and theft has led manufacturers in the global market to integrate advanced features such as smart locking technology. Apart from the smart security authentication, the smart ticketing systems are equipped with water-resistant features, due to which the life-span of the ticket is comparatively longer as compared to a typical paper ticket. Manufacturers are increasingly integrating intelligent technology in the smart ticketing systems in order to increase their customer base. Bound to features such as fingerprint recognition algorithm and ultra-touch fingerprint sensors, adoption of the smart ticketing system will continue to increase in various industries. In addition to the security features, smart ticketing systems are further equipped with blockchain (the database technology used by Bitcoin system), digital sensors and artificial intelligence. Emergence of the smart ticketing system has continued to benefit the transportation industry significantly. Adoption of smart ticketing system for the public transit system such as buses, trains and airplanes will continue to gain momentum attributed to quick access and robust security features. Surge in the number of collaborations and partnerships among the market players will continue to impact growth of the global smart ticketing market positively. For instance, a leading digital security company, Rambus Inc. has recently announced that the company has increasingly collaborated with the Acxsys Corporation and Samsung Canada. The companies will mainly focus on developing the Interac Token Service Provider (TSP), which will enable the Interac end users to make safe payments through tokenized transactions. Increasing use of the Point of Sales system in the shopping malls has significantly contributed towards growth of the global smart ticketing market. On the basis of end users, the POS terminals segment is projected to generate significant revenues in the global market. This segment is expected to represent a value of over US$ 500 Mn by the end of 2017. However, the card readers segment is expected to register a robust CAGR in the global market during the forecast period. Based on technology, the WiFi segment is expected to represent the highest revenue growth, accounting for a value of over US$ 200 Mn by 2022-end. This segment will witness the fastest growth in the global smart ticketing market throughout the forecast period. By industry, the transportation industry is expected to witness significant revenue growth, representing a value of over US$ 600 Mn by 2022-end. However, the parking segment will register the highest CAGR in the global smart ticketing market through 2022. Leading market players in the global smart ticketing market include Xerox Corporation, Cubic Corporation, Gemalto NV, Rambus, Confidex Ltd., NXP Semiconductors, CPI Card Group, Infineon Technologies AG, HID Global Corporation and Giesecke & Devrient GmbH.